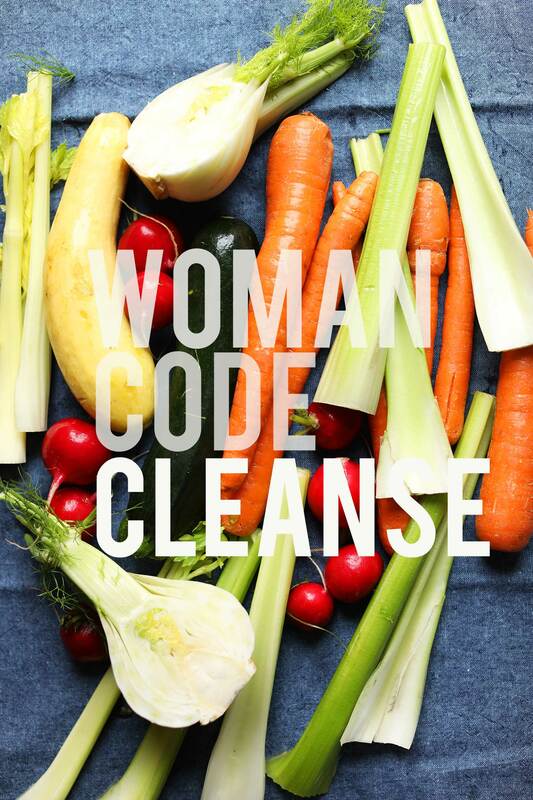 After sharing briefly about a cleanse I was doing outlined in the book The Woman Code by Alisa Vitti, many people asked if I’d share a more detailed account of my experience and what meals I ate during the cleanse – specifically if they were vegan-friendly. Consider this my review. 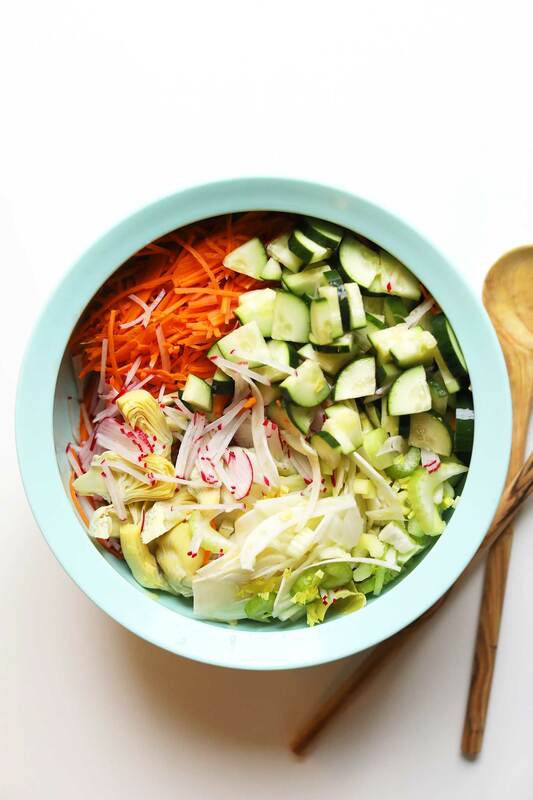 There’s a whole slew of reasons to do cleanses and that’s not what this post is about. This post is about this cleanse in particular, why I chose to do it, what meals I ate, and what my overall impressions of it were. I’ve never done an all juice cleanse, only whole foods-focused cleanses with an end goal of either detoxifying the body or healing a certain symptom. In this case, I was cleansing because I – like many women I’ve spoken to – have suffered from hormonal imbalance and wanted to try a dietary approach to begin healing my body – emphasis on begin. I don’t think this is the cure all answer for getting your hormones back in order or to eradicate symptoms you may be having, rather it’s a reset for your body to hopefully better support natural hormone balance moving forward. The primary symptoms I’ve experienced off and on over the last two years have been hormonal acne along my chin and neck and hair loss, which I talk in detail about here. I won’t go into the various other treatments I’ve tried for these symptoms (none of which have been successful anyway), only that I was at a pretty desperate place with my skin and this cleanse sounded like it would help jumpstart my body in the right direction. The cleanse outlined in the book lasts 4 days and is whole foods focused. 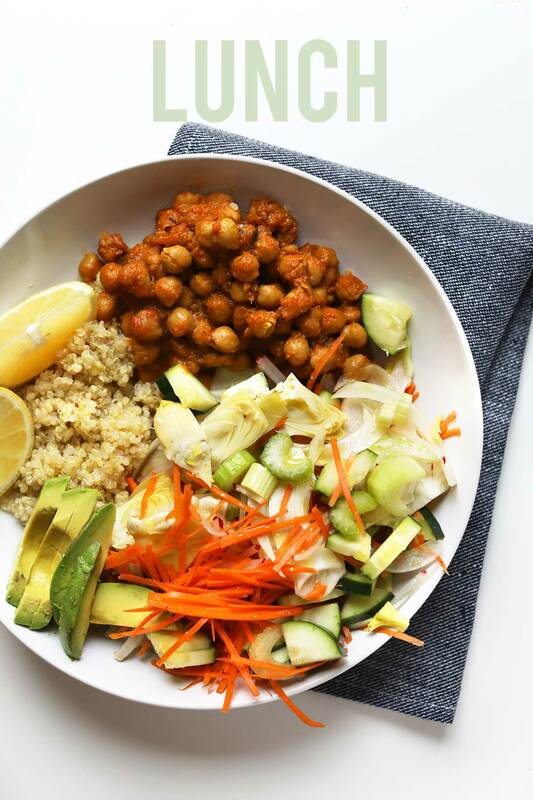 While it does recommend salmon/fish as a protein, you can easily sub legumes to make the cleanse vegan-friendly. I’ve enjoyed it both ways, having now done the cleanse twice over the span of a couple months. From what I understand, Alisa does not go into detail about what you can’t have during the cleanse (i.e. alcohol, caffeine, etc. ), but rather shares what you can eat. To me that means “consume these foods and beverages and leave out the rest.” Others may interpret that differently, but I thought it was worth clarifying. In addition to eating the meals outlined below, I chose to avoid: sugar of all forms (natural and processed), alcohol, caffeine, coffee (even decaf), and any drink or food not listed in the cleanse. The meals are pretty straight forward and essentially repeat themselves over the course of 4 days with minor variations (i.e. add avocado to a salad, or, eat 1/3 cup serving of beans instead of 1/2 cup). Because these are not my recipes to reshare, I don’t intend to fully list out each recipe, but rather share photos and give you a general idea of what you’ll eat if you decide to try it. For the recipes, simply purchase the book. It’s affordable and one of the best investments I’ve made in my personal health. Over the last two years I’ve referred to it a number of times for troubleshooting and fine tuning. Alisa recommends prepping your meals ahead of time so you always have something healthy to eat. 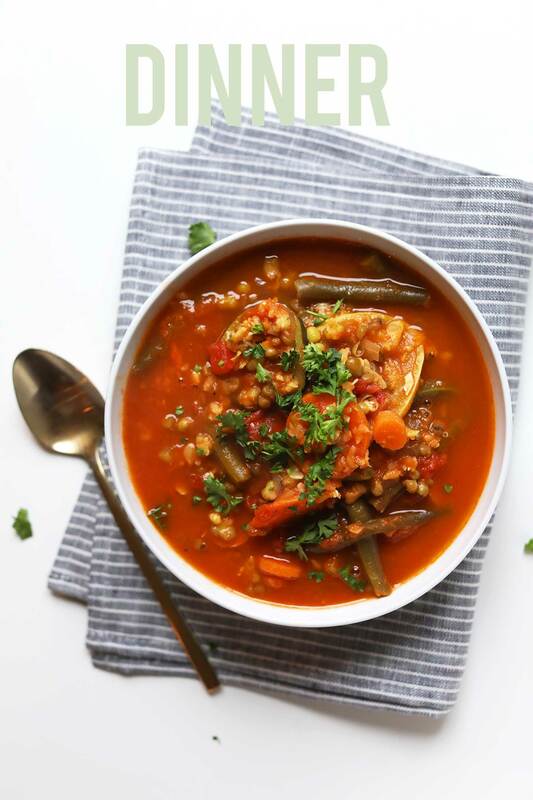 I chose to do the cleanse on a Monday – Thursday, so I made a big pot of the mung bean vegetable minestrone on Sunday and enjoyed it throughout the week (I even froze some leftovers so there was so much). I also prepped a big cleansing salad (pictured above as well), and a large fruit salad. All of the recipes have specific ingredients, each with a purpose, so I followed the recipes Alisa provided to a “T” in order to get the best results. Here’s what I ate. 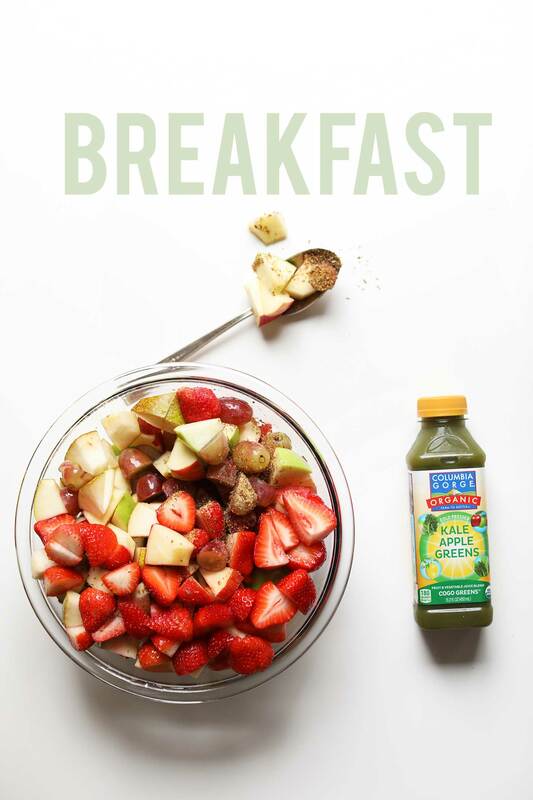 For breakfast I enjoyed a generous serving (~1 1/2 cups) of this fruit salad, which was tossed with lemon juice and flax seed, as well as a green juice. On the side I also enjoyed a cup of hot water with lemon, which is also very gentle on and detoxifying for the body, especially in the morning. Alisa permitted snacking on this fruit salad, the vegetable salad, and tea, but I usually found that this meal, plus plenty of water between 9 am and 1pm left me satisfied. For lunch Alisa recommends a generous portion of the cleansing salad, brown rice or quinoa (I chose quinoa), and either salmon or legumes. The above photo is actually a serving of some leftover chickpea curry I’d had from the day before, but the other days I opted for lentils or salmon as my protein. As recommended, I dressed the salad with a splash each of apple cider vinegar, lemon juice, and a drizzle of extra virgin olive oil. For dinner each night I had a bowl of Alisa’s mung bean vegetable minestrone, which may not look (or sound) like much, but is actually quite delicious. 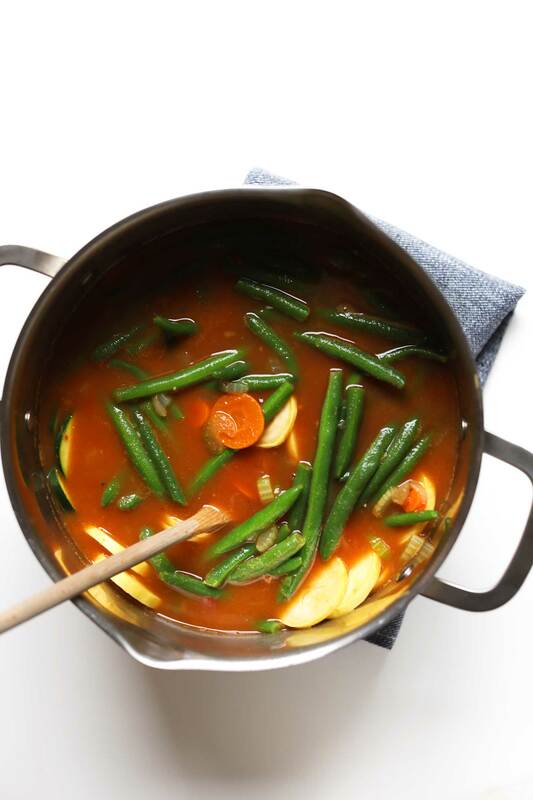 It’s hearty and comforting and provides plenty of plant-based fiber and protein. Sometimes I left it as is, or would add steamed kale, fresh parsley, or fresh garlic. In the evenings after dinner I enjoyed a cup of dandelion detox tea or more lemon water. Alisa recommended eating dinner 3.5 – 4 hours before bed so the body has time to process the last meal of the day. I liked this routine because I went to sleep satisfied, but woke up the next morning ready for breakfast. Overall , I really enjoyed this cleanse. The food was simple and satisfying, and the instructions were very easy to follow. I honestly didn’t feel deprived since I was eating such wholesome, satisfying meals. I’ve actually adopted some of the principals from the cleanse into my everyday routine now, such as green juice with breakfast and shying away from grains and sugar in the evening. In addition to feeling nourished, I also felt like my bloating was greatly reduced, my digestion improved, and my skin cleared substantially. The week prior to the cleanse I had a pretty bad breakout and by the end of the cleanse it had virtually vanished. Thank you so much for reading about my experience. I hope you find this review helpful. I was not paid in any way to share about this book or the cleanse, and have never been in contact with Alisa or her team. I just wanted to shed a little light on something that I found incredibly useful and healing for me. Thank you for your review! I started the cleanse today and am already feeling lighter. I have been extra stressed lately and have had horrible cystic acne. Hoping it clears up a bit with this cleanse! WomanCode is a life-changer. I also suffer from hormonal acne and PCOS and found this cleanse to be easy and satisfying. I read a little about your health challenges and found comfort that I am not alone. You are not alone either ! Thank you for all of your ongoing wisdom and research. Your blog is a favorite. I am just reading The Woman Code now. As a vegan, what should I eat for dinner that doesn’t include grains? I’m struggling with being hungry and not satisfied after dinner. Thank you so much for sharing about your hair loss. I also had my own share of hair loss a few years ago during a period where I was in grad school (and stressed out) and I had also stopped my birth control. At the time I didn’t think I was stressed out but looking back now, I definitely was and changing hormones certainly compounded the issue. I think I also lost about 50% of my hair. I went to the salon and had it all chopped off while I cried my eyes out thinking I’d eventually go bald. I know it sounds crazy to care so much about hair and stress so much about hair loss but it’s a part of our identity ever since we can remember so losing hair means losing a part of us — so it’s okay to be self conscious about it. But sounds like you’ve got a good handle on it now. Anyway, just wanted to share too, and to let you know you’re not alone, and you’re doing an amazing job, and keep doing what you’re doing! Know that your hair loss will eventually correct itself — mine did. I still lose a lot of hair but my hair is adapting and now it is growing faster to keep up with the loss so I have no net loss or gain. Thank you for your amazing recipes and gorgeous photography! So kind. Thanks for sharing Melissa. Yeah, I’m still in a loss phase but it does continue to grow back so that’s encouraging. Hope you’re on your way to recovery as well. Thanks for the kind words of encouragement! Dana, thank you for doing this reveiw. I too have read the woman code book and have been roughly following the eating guidelines for hormones. I used to suffer from severe mentral cramps before i went on my birth control. Since going off it i havent experienced any cramps! I have yet to try the cleanse but I am more motivated to trying it after reading your experience. Thank you! Will be anxiously awaiting to hear! Thank you! I don’t want to go back to meat for the sake of my hair and nails. Hope they can figure out what it is. So you’ve had the hair issues too, I see. I’ve been vegan for nearly a year and back in the early fall, not only did I notice that my hair was really coming out but also that my nails weren’t growing. I’ve been supplementing all along with B12 but since then have added vegan Omega 3 DHA and vitamin D. The nails are growing a bit but hair still falling out. Did you ever figure yours out? See a doctor to find out why? That’s my next step but thought I’d ask you first. Thanks!!! Hi Lorrie. I am sorry to hear you’ve been experiencing those symptoms, too. To be honest, I haven’t found a solution yet. But am visiting a specialist next week and am hoping to be able to report back with good news! I would be interested to hear results as well. I have been losing a large amount of hair for quite some time, and nothing except hormone imbalance seems to come up. I can’t take oral (synthetic) hormones because they caused liver lesions that I had to have removed. I’ve just been prescribed hormone cream for recurrent UTI’s but have been afraid to try any hormones again. The only reason I learned about the liver lesions, was because of all of the GI issues as well. This was 4 1/2 years ago, and I felt much better afterward but have slowly crept back to having all kinds of issues again. I eat gluten free and have for some time now. It does seem to help, but is not the total answer. Best wishes, and thank you for your posts! My vegetarian neighbor’s specialist told her that it was her anemia causing the hair loss, yet despite taking iron supplements, and only most expensive one seemed to help the most , didn’t make a big difference. A couple of ounces of only Grass fed humanely sacrificed (in the meadow by a sniper in the middle of the night) local beef that she picks up from the farm quarterly, had her hair growing thick again and her iron levels shot up. I hope you don’t mind me responding to your comment, but I’ve been a vegan for just over 2 years and have found the exact opposite my hair and nails, skin has never looked better. I’d really be stabbing in the dark but could it be a zinc deficiency? I dunno I’m not a doctor or anything. Maybe talk with a dietitian who specialises in plant based? I could give you some ideas of what I eat day to day. I just thought I’d respond as I felt awful for you going through that and not knowing what is the cause. Good luck I hope you get it all sorted. Have you got your hormones checked? I’d recommend that as a next step. No, I haven’t yet. Which hormones are you referring to? Did your doc check yours? Any solutions for you yet? I’m totally late to the game here, but my friend was having serious issues with her hair falling out a year + after giving birth. Tests revealed she had an iron deficiency. She said iron supplementation has significantly helped her. Floradix (sp?) has a vegan, gluten-free liquid form of iron. Thanks for sharing! I’ve taken iron off and on and that doesn’t seem to do the trick for me. But thanks for sharing! Thank you for this review! I just happen to be 7 chapters into this book right now but hadn’t fully committed to doing the cleanse she outlines. I have struggled with a pretty awful chronic disease for years that has me stuck at home most of the time but am always searching for ways to improve my symptoms and offer my body the most optimal conditions for health. Food has been my pathway towards returning to whatever equilibrium my body is capable of reaching these days! I was glad to hear you have tried the cleanse with and without the salmon. I am forever in a battle with myself over returning or not returning to including animal protein in my diet! This is inspiring. I think I may well try it. I have become obsessed/addicted with chocolate in the afternoon and not feeling satisfied with fruit before bed (in the past that has been fine). I’m worried about headaches from leaving behind black (morning) and green (afternoon) tea. I like the idea of feeling prepared so I may wait a few weeks (I’m traveling next week) until I can do that!